Posted by davegoblog in Environment, Pollution, Sports. 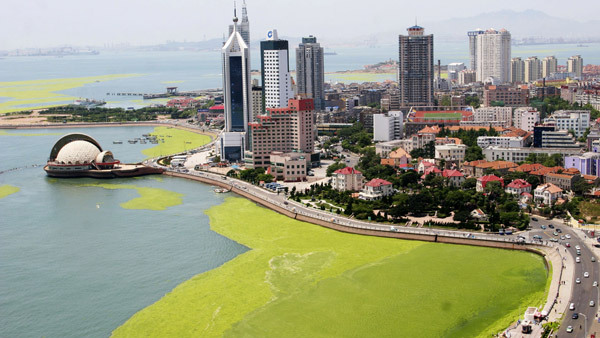 With about five weeks until it plays host to the Olympic sailing regatta, the coastal city of Qingdao, China, is experiencing a huge algal bloom that covers a third of the course. Local officials have mobilized 20,000 people and 1,000 boats to help with the clean-up and haul away the algae. They believe the sailing area should be clear by July 15, and the government plans to install a fenced perimeter in the Yellow Sea more than 30 miles long in attempt to block the algae from floating into the area. Water quality has been a concern for the sailing events, given that many coastal Chinese cities dump untreated sewage into the sea. At the same time, rivers and tributaries emptying into coastal waters are often contaminated with high levels of nitrates from agricultural and industrial runoff. These nitrates contribute to the red tides of algae that often bloom along sections of China’s coastline. However, Qingdao officials say there isn’t a “substantial link” between the pollution & poor water quality and the current algal bloom. They instead blame it on increased rainfall and warmer waters in the Yellow Sea. Either way, algal blooms can result in dead zones (where many fish and aquatic insects cannot survive) like the one in the Gulf of Mexico. With the world watching the upcoming Olympics, I hope that this event will bring more needed attention to what’s happening to the oceans and seas as a result of our actions. In the life of me.